African workers, although they work the mines in Tanzania, see none of the wealth that their work provides. LONDON––Tanzania, like the rest of African countries, is facing hardship with a GDP of $45 billion in 2015 and about 70 percent of the population living on less than $2 a day. According to Ft.com, 70 percent of the population is employed in agriculture. However, the newly discovered vast gas field and the production of gold make Tanzania a place that will aggressively attract the usual giant mining and energy companies. 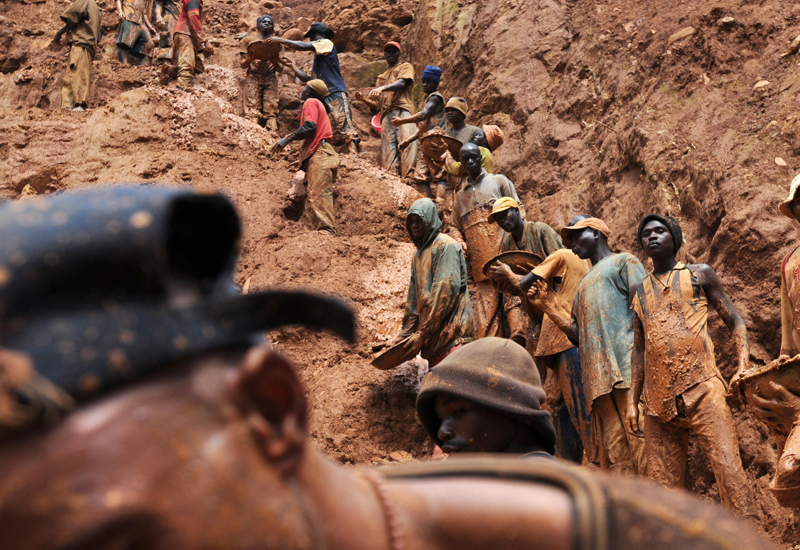 How to handle the corrupt practices of a multinational corporation mining in Tanzania? Barrick Gold is a multinational imperialist corporation that has been mining gold in Tanzania. The Tanzania government has been looking into Barrick Gold and its subsidiary Acacia Mining, and its malpractices have been publicly debated there. Today Tanzania is amongst the five top producers of gold in Africa, but the country has nothing to show for it. Barrick Gold claims that they have not been making profits in the country and makes threats to close the gold mines to dissuade the government from asking them to share with them the profits they have been reaping from African gold in the country. Imperialism does not concede anything to oppressed peoples on its own accord or because of its morals. It only concedes if they are forced to do so by the higher power of a peoples-led, genuine anti-colonial government. The nature of Barrick Gold can be clearly traced in its intervention in regime change in Democratic Republic of Congo where, it financed the rebellion to overthrow Mobutu. Barrick Gold has a hand in the current Congo genocide. They have no consideration for African workers lives! This is something that Tanzania’s president John Mafuguli and the entire ruling class in Tanzania are aware of. The question that president Mafuguli is grappling with is this: How can a single country in Africa get a favorable deal from imperialism for its riches? “There have been instances where a mining company operates in the country for 10 years but still its officials are telling you that they don’t make any profit…if that is the case, they better go back to their countries. “African governments, instead of getting together in united action which would stimulate maximum capital accumulation and the construction of a solid over-all African economy, are granting concessions for the working of mineral, agricultural and forestry resources whose purpose is the drawing off of output to sustain and enlarge the industries and economies of the imperialist countries. “Not one of the investing syndicates has any intention of founding in any one of these countries an integrated industrial complex that would give impetus to genuine economic growth. White imperialist leaders mercilessly continue to destroy our lives, societies and particularly our ecological environment with impacts that will last for thousands of years with the active and willful collaboration of African governments. If we are going to win in Tanzania, the ongoing dispute between Barrick Gold and the Tanzania government must be seen in the context of European/North American oppressor nation versus the oppressed African nation in order to grasp what is at stake. The conflict between Tanzania’s government and Barrick is not restricted or limited to these two entities. It is a concrete example of the class question being concentrated in the colonial question. It is the African nation versus the U.S.-led white nation in Tanzania. All neocolonial governments have shielded imperialism’s monstrous criminalities and other unimaginable violence that they have plagued African lives with everywhere on this planet. The control of our reality by the lies of white media is another factor that shields imperialism’s daily crimes against humanity from being exposed to the world. Barrick Gold and Acacia Mining are an international white predator company with an international strategy. It is part of the whole imperialist assault on Africa and the rest of the oppressed nations. One cannot engage against them without conceptualizing an international strategy to deal a defeat to imperialism in its neocolonial form. We will support all genuine struggles against imperialism in Tanzania. We know for certain that the African petty bourgeoisie is not going to fight against neocolonialism in Tanzania because they are the neocolonialist. We cannot take control of Our Africa and our lives short of the unification of Africa against imperialism. That is why it is imperative that African workers in Tanzania be united with all African workers across the globe to strategize as part of one organization to unleash the final struggle for the total emancipation and liberation of Africa, the basis for Africa’s rapid industrialization. Build the African Socialist International!